Cannon County High School Outdoor Club took advantage of a day off Tuesday and traveled to Dale Hollow Lake 15 miles North of Livingston, TN. Dale Hollow is formed by the Obey River and is known for it's great water clarity and world class small mouth fishing. 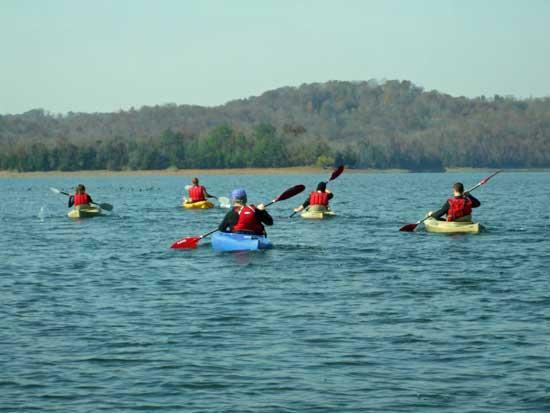 Dale Hollow is also a great paddling destination with several islands to explore and to camp. Eight paddlers spent the day kayaking and exploring islands and gravel bars. Paddlers included Brock Francis, Brittany Ferrell, Justin Prater, Marc Larson, Emory Larson, Doug King, Charles Steelman and Cody Phillips.